The Lago model of SaddleBrooke Ranch Villas is a great choice for those looking for larger a retirement home or winter retreat. With almost 1,777 sq. ft. of living space the Lago home is an open great room floor plan. And the best part, it will be maintenance free. The floor plan for the SaddleBrooke Ranch Villas Lago model provides lots of space and a large outdoor area. 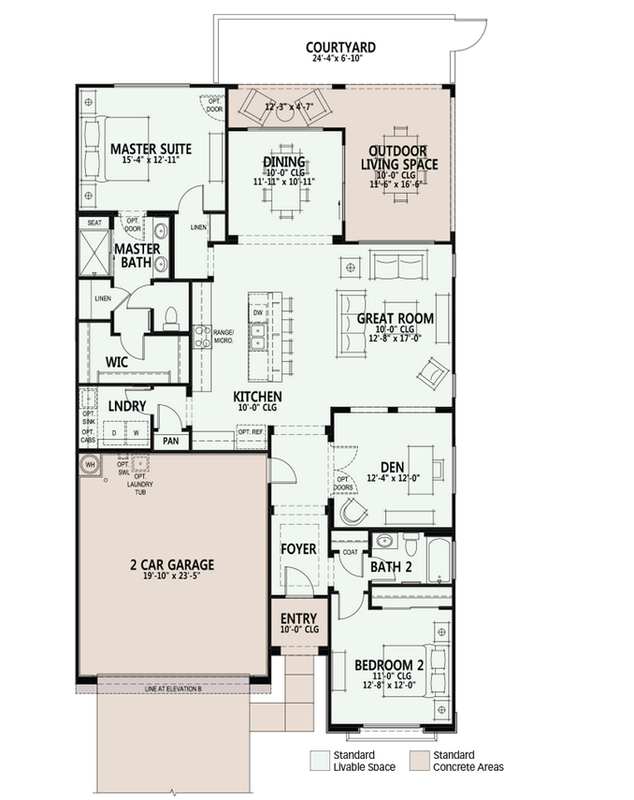 A Split bedroom floor plan and den make this model a perfect choice for year around living or a winter get away. The SaddleBrooke Ranch Villas Lago model offers 2 elevations for architectural styling choices. Are you thinking of buying a home in SaddleBrooke Ranch or another 55+ adult community? If so the Lago model may be what you are looking for. If not, there are other options. Build one of the other model homes or look for a resale. We will help with both option.